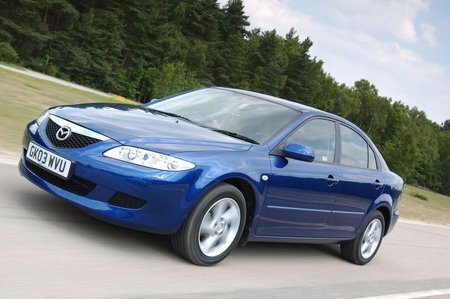 Used Mazda 6 Review - 2002-2007 Servicing, MPG, Insurance | What Car? What used Mazda 6 hatchback will I get for my budget? How much does it cost to run a Mazda 6 hatchback? Mazda dealers charge plenty for servicing and repairs, but most, at least, will treat you politely and fairly. During the car's early years, it's probably worth staying with a main dealer just to get a set of Mazda stamps on the service records. Because Mazdas are so dependable, you shouldn't see many unexpected bills until well into the 6's life. Switching to an independent garage should cut your bills, although this may not be as easy to do as it is for Ford and Vauxhall owners, simply because there are fewer Mazda specialists out there. Insurance groups are low for a big car: group 7 for the 1.8 and the 119bhp 2.0 diesel, group 9 for the 2.0 petrol and 140bhp 2.0 diesel, and group 13 for the 2.3. As you'd guess, the diesels travel furthest per gallon, the 140bhp returning up to 47mpg overall and the 119bhp 43mpg. The 1.8 manages 36mpg, the 2.0 35mpg and the 2.3 28mpg.